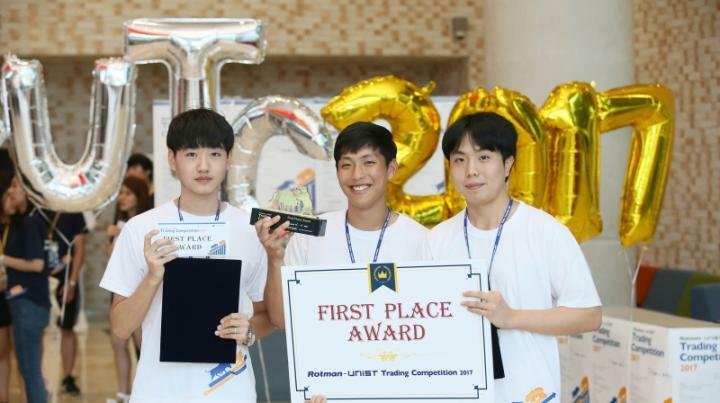 On August 10, UNIST hosted the first Rotman-UNIST Trading Competition (RUTC), bringing together teams of primarily graduate-level students and their faculty advisors from top-ranked universities across South Korea to partake in a unique two-day simulated market challenge. Modeled after the highly successful Rotman International Trading Competition (RITC), the Korean variant was built with the cooperation between UNIST and the University of Toronto's Rotman School of Management. This event illustrates both of their commitment to experiential learning and preparing students for the competitive field of finance. The competition used the Rotman Interactive Trader, an order-driven market simulator, which was developed in-house at the University of Toronto's Rotman School of Management, and used by universities and professionals around the world. For this year's trading competition, representatives from the Rotman School's BMO Financial Group Finance Research and Trading Lab including Marco Salerno, lab manager and Eric Kang, assistant lab manager, visited UNIST to deliver the competition cases. These cases were, then, used to test participant's decision-making skills in a variety of market scenarios, involving risk management and trading roles. A total of twenty-eight teams of student traders from twenty-one universities in South Korea partook in 2017 RUTC. During the two-day event, students competed in a diverse range of cases, including the energy trading case, sales & trading case, open outcry case, liquidity, and algorithmic trading case. Two teams from UNIST triumphed in the two-day competition with 21 universities across the nation. The first place award went to team, named MSG consisting of SangHwan Noh in School of Technology Management, MyeongJung Kim and GyuMin Lee in the School of Management Engineering. The second place winning team, Hellsing consisted of Yeong Tahk Cho in the School of Management Engineering, SangHoon Park in the School of Technology Management, and HyeonSan Moon in the School of Life Science. The third place award went to a team, named CMRC from Hankuk University of Foreign Studies. This competition will also contribute significantly to the cultivation of oil trading experts for the Northeast Asia Oil Hub Project that the city of Ulsan has been promoting. Through this, UNIST has established a significant status for itself in the cultivation of skilled trade workers in the areas that involve mining, manufacturing, oil and gas. The Rotman School's BMO Financial Group Finance Research and Trading Lab is designed to promote experiential learning in the area of financial markets and data. The competition cases are implemented on the highly acclaimed Rotman Interactive Trader application, a market simulation tool being used in over 55 universities and financial institutions around the world. The Rotman International Trading Competition (RITC) is an annual event that brings teams of primarily graduate-level students and their faculty advisors from top-ranked universities worldwide to participate in a unique three-day simulated market challenge. Every year, RITC participants are invited to participate in various activities including electronic and outcry trading cases, seminars with industry practitioners, and social events with their fellow competitors from around the world. The Rotman School of Management is located in the heart of Canada's commercial and cultural capital and is part of the University of Toronto, one of the world's top 20 research universities. The Rotman School fosters a new way to think that enables our graduates to tackle today's global business and societal challenges.